I have had a car on SORN (Statutary Off Road Notification) for a few months. Although on a shared driveway, it didn’t block it. But I couldn’t do work on the car without moving it to block the driveway, potentially for a week, which was not acceptible. But the neighbour is about to have major building works done. I agreed to move the car. Another neighbour offered, but then withdrew his offer on a flimsy excuse. Then came the Ultimatum. Move the car, and it mustn’t return. So clearly some bullying had been going on. I’m looking forward to the revenge, of sticking the car back there, but taxed and MOT’ed (it’s always been insured), but this time due to lack of roadside space. Who is he to tell me to scrap a car (or anything else)? Apart from removing neighbour from my christmas card list, I had to act. Fortunately through a network, I found an understanding car fanatic (who I already knew in a friendly way) who had spare concrete space and willing to let me use it. He apologised it wasn’t under cover (as if mine were!). Only I had to get the car there, with no MOT or tax, and it was 25 miles. Only one solution, a car transporter. There are websites where you can plug in details, and see if any “passing trade” will offer. I did get a couple of offers at price x, but none responded when I tried to contact them to take it up. The other option was to hire. And I found a place that would hire. Price 1.6x. But it was the only viable option, so I walked to the depot (I didn’t know where I would park my car had I driven). I rather think he didn’t expect me to take him up on the offer. As I arrived, some kid came storming into the office shouting, all sorts of things. It seems he was so late in returning a car, he still hadn’t. And there was a lost key. So he was going on the attack as his defence. After half an hour, the owner was able to come back to me. I pointed out I had not heard one apology in the whole guy’s rant. The deal signed, the owner showed me, and let me run the slide/tilt mechanism of these car transporters. As my car runs, there was no need to use the hoist. Then a quick trip just to help me get used to it, and it was mine for a few hours. A Mercedes-Benz Actio 7.5ton lorry with modified bodywork. The first trip was interesting through the centre of Tescoville, with roadworks and narrow lanes because of road works. This being the largest thing I have ever driven, including a 16 seat mini-bus while at Uni. So I got close to base, but found a level road with suitable space for the transporter to park (I was told makes loading so much easier on the level). 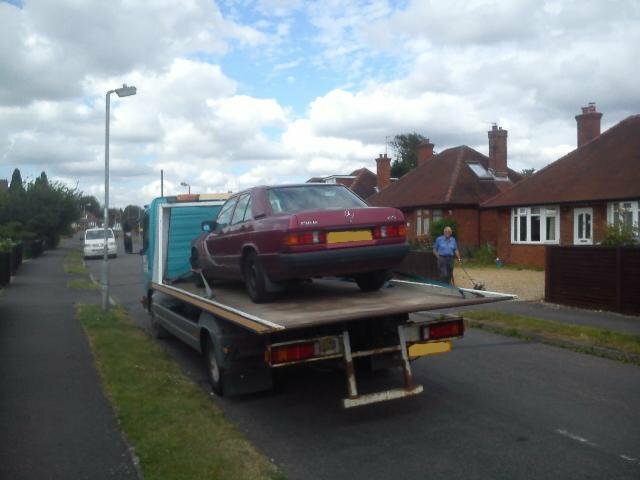 Then I fetched the car (I was prepared to drive half a mile, but not 25 miles on main roads etc), and doing as I had been taught, loaded her up. It was quite fun. And I put the restraints around the two opposing wheels. (Photo). Then off we went. I had to choose the route carefully, both for my unfamiliarity with the lorry, and speedbumps. I found that first gear was unnecessary (it was also difficult to select), just like a Ford, in fact. I drove on A roads to my friend’s place, partly as it would be slower (but I realised, many more potholes!). But I soon realised I was rather enjoying the whole adventure. I mean, I had been in these trucks before, when a car had broken down, and I had to be rescued, but this time I was doing it all for and by myself. Having offloaded the car at my friend’s place, and a few minutes chat, it was return to base. For they may need it for the Friday night rescue service. Because the current Tescoville roadworks closes the main A road through town every night, I decided to take the motorway, and then back down to the A road the far side of the roadworks. With no car on the back, I was able to take the old girl to her speed restricted limit of 56mph. I was having fun! Just before I returned, I added fuel, at a rate I calculated plus a little bit more (and I was about right, it was just a little more), and dropped the lorry off at the depot, whose gates had been left open for me. So I phoned the owner, to say lorry returned, keys through the door, and if it wasn’t so expensive I’d do it again! Mind you, 1.9x (with fuel etc) the poorer. I didn’t mention, but the last time I had driven a manual gearbox vehicle was three years ago. So I was pleased how easy I found the gearbox (other than 1st gear, which I soon found wasn’t needed on the level) and clutch control was still pretty good. The one stall I made wasn’t clutch, it was the operation of the handbrake, being slower to come off than the level suggested.